Paperback is, I think, objectively a good game. It’s just not the game I wanted, which is why it got it a somewhat ungenerous three stars in our review. I think though most people will enjoy it more than I did, because fundamentally they don’t consider word games to be war games. But the question is – if you do like it, can you play it? Let’s lay down some letters, in a vaguely grammatical fashion, and find out. It’s fine – there’s nothing in the game that uses colour as the only visual discriminator. The nice art-work doesn’t look quite so good through the lens of colour-blindness, but the garish palette produced doesn’t actually interfere with gameplay. 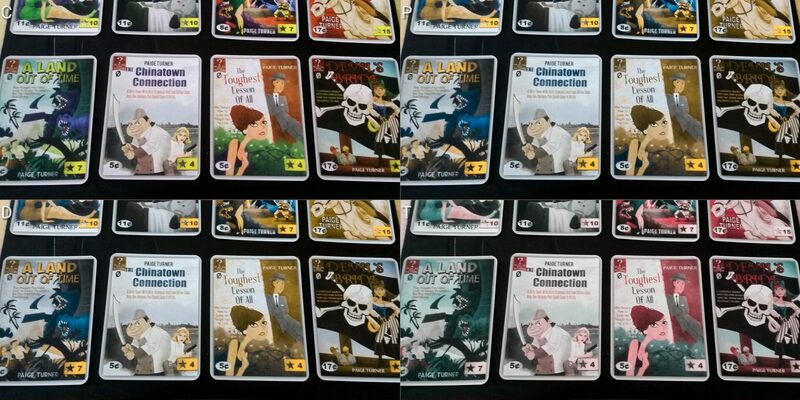 Each of the different valued cards is colour coded. 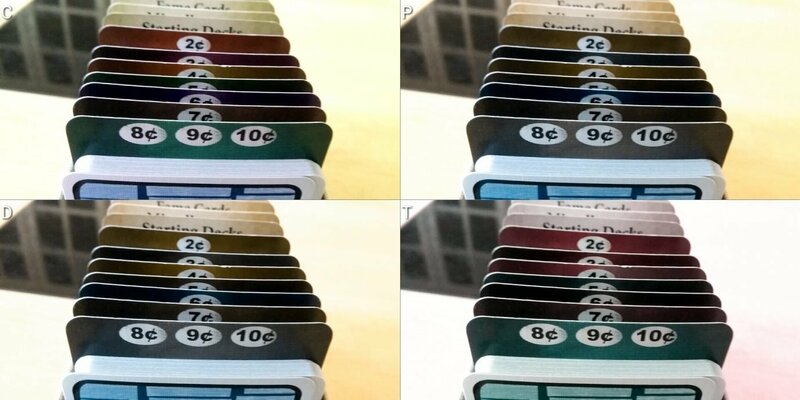 This is impacted upon by colour blindness. The value though is clearly marked on each card so again it has no gameplay impact. Paperback receives a strong recommendation here, in other words. The game also gets a reasonably strong pass in terms of its visual accessibility. The cards have huge letters on them, and are very well contrasted against their backgrounds. Letters are well contrasted, regardless of the background colour. The instructions for special cards, where they exist, are in a much smaller font. They’re still readable, perhaps with the assistance of a magnifier. Card values are well contrasted, and even the card costs are reasonably easy to make out with some assistive support. The fame cards are the only potentially problematic area since they are quite visually cluttered – there’s complete consistency though on where key information points are to be found. Fame points are in the bottom right, card points on the top left, and card costs on the bottom left. As such, the cards lend themselves well to visual interrogation. Shared state, such as the common cards, changes only occasionally and a maximum of four times. Fame cards have a limited supply, but it’s not a secret when they’re purchased. The number left in each pile is open information, so there’s no leaked game state associated in simply asking what the current offer contains. 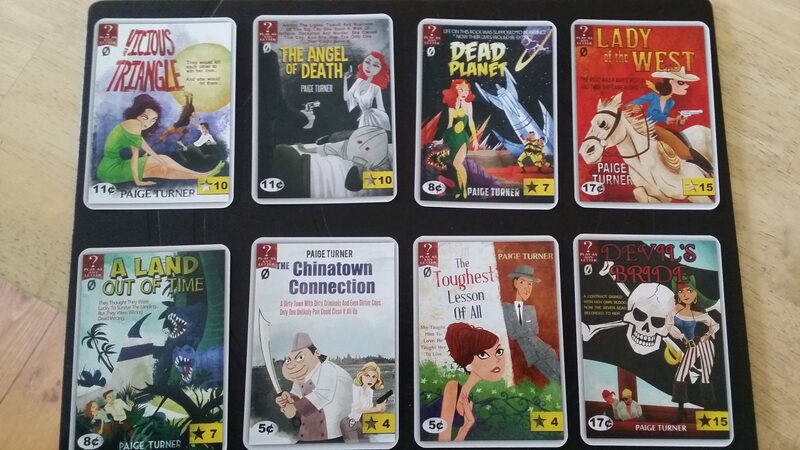 Paperback is a game that involves hidden hands, and hand management – usually you’ll be dealing with only five cards at a time, which limits the difficulties that are usually associated. That is until you’ve picked up a few power-up cards, at which point anything goes. Some cards permit you to draw larger hands, or have conditionality based on the exact composition of the cards you’re holding. These are temporary modifiers for the most part. As with Star Realms, you build up a larger and larger deck as time goes by, but you don’t get a choice as to what cards in it are played into your hand. You get the ones that are dealt out in order. There are no complex interrelationships of the cards that require you to assess them against each other, although some powers trigger only when a card is played at a particular position in a word, such as at the beginning or in the end. It’s reasonably manageable, although the fact that you discard all cards in your hand at the end of a turn limits strategies for offloading visual assessment onto memory. As usual, our teardown here assumes some degree of ability to visually discriminate with support – we encounter the common issue that there is nothing with tactile differentiation for those that are fully blind. As far as the game can, within that limitation, it does a good job of supporting visual accessibility through graphical and mechanical design. Ah, here’s the rub. It’s a game where, at least to a certain extent, you’re being rewarded for linguistic dexterity. It doesn’t have the wordplay within constraints that defines Scrabble, and it’s a great deal looser because of its heavier provision of wildcards. It’s certainly then on the lighter side of word-game complexity. Even so, by its very nature the game requires a significant degree of verbal fluency if it is to be played effectively. Word play is important. In Scrabble, blank tiles are actually cognitively expensive to consider – paradoxically, by acting as any letter they don’t ease the job of making the word, they expand the search space that must be considered. A single wild-card in a hand tends to have this effect. The more wild-cards available the easier it becomes. The search space becomes large enough to just pluck out words largely at random with a reasonable confidence they’ll fit. The regularity with which letter combinations will bounce back into your hand also has a powerful effect on making the mental search space more easily explored. The same words tend to come back into repeated prominence because you’re only ever working with a letter set that you yourself had a large part in building. The complexity of the game state is never particularly high, and there aren’t a large number of conditional or synergistic rules that need to be considered. Conditionality, where it arises, is temporary – based on attacks that have been played against you, or on powers that you have managed to execute in previous turns. These can layer together though, and may come from multiple different sources. Game flow is regular, although the exact number of cards that any player might draw, as well as the specific implications of scoring, may vary from turn to turn. Similarly, the common card that is available to all players will change as time goes by, meaning that previous deck composition may not be compatible with the choices available in the next round. None of this is particularly taxing though, and the game should be playable with care. Memory requirements are quite high for effective play, because knowing the composition of your deck is vital in assessing which cards you should buy from the offer. You can always browse through your discard pile, but the active deck’s composition is supposed to remain unknown. As such, you’re going to need to be able to keep track of what letters you have, what letters you’ve spent, and what letters you need to build up the longer chains that will get you greater points and common cards. All of that said, the word-play required is easier than in many word games, largely due to the reliability of the letter-set you work with and the generous allocation of wild-cards. It’s possible to reduce the complexity even further with some house-rules – smaller words but double value, for example. The game also comes with a cooperative variant in which everyone works together against a timer, which can alleviate many of the cognitive issues that might otherwise be experienced. You can distribute responsibilities for successful play so that a greater burden is placed upon those most able to bear it. Scoring is straightforward enough, with only a few occasional card based complications in the case of turns, and only a few award and theme based elements at the end. It’s really just a case of counting up either the value of played cards, or the number of stars in your deck. The implication here is that a degree of numeracy, as well as literacy, is required for autonomous play. The level isn’t high, and tops out at basic summative arithmetic. So, we tentatively recommend Paperback for both categories of cognitive impairment. As is often the case you should be careful to consider the implications for the particular group with whom you will be playing. As with most deck-builders, lucks plays a considerable role in gameplay. Unlike most deck-builders, the flexibility afforded by the wild-cards means you are rarely left without a sensible option on your turn. Sometimes it may be difficult to make good words, but you’ll almost always be able to make something worthwhile. Effective play is reasonably easy – optimal play requires the convergence of luck and skill. The role luck plays is an important element in ascertaining emotional suitability for a game – here it’s a factor, but not an overwhelming one. Player competition is only indirect, and has limited effectiveness turn to turn. The attack cards that exist in the deck are not particularly powerful, and the game even recommends you don’t play with attack cards, at least to begin with. You can remove them and still have a perfectly satisfying game of Paperback. You may want to consider this if competition creates emotional distress, but the attacks that exist are quite tame. They’re things like ‘draw one fewer card’ or ‘you can’t play wild cards this turn’. Rarely do they actively undermine a turn, although they will bleed away at some of the progress someone may otherwise make. The nature of the deck-builder aspect though means that attacks will keep on happening which may be a source of some frustration. A feature the game shares with Scrabble is that a highly verbally dexterous player will just come across as inherently smarter than other players. If someone plays ‘effervescent’ and all you managed was ‘doggy’, it’s easy to read a failing on your part into the disparity. Such personal judgements tend to work badly with certain categories of behavioural and emotional impairment. To an extent, the easy availability of wild-cards mitigates this – the bar to playing clever words is reduced when most of the constraints are removed. A good vocabulary though will still shine through, and this may be frustrating for those that don’t feel entirely comfortable with verbal fluency in social settings. Score disparities, when they come at the end, can be considerable but usually they are not seriously divergent. The game ends when two fame card piles, or all four common cards, have been claimed. As such, unless someone specifically goes out of their way to humiliate an opponent the game tends to end before seriously large point totals can be accumulated by either player. New letters open up your hand and make available new and more interesting words, and since Paperback is a word game you’d be forgiven for thinking this would be a dominant strategy. It’s buying fame cards though that will win the game, and if you’re focusing on the fun of words while someone else is focused on the mechanics of victory, you’ll find yourself at the fuzzy end of a very large point deficit. The timing of when you start to buy fame is largely what will influence this outcome. Overall though the competition is so light and the game itself so agreeable that it’s hard to imagine situations where anyone is likely to become genuinely upset through play. This is especially true given the ease with which attack cards can be removed from the deck. We offer a recommendation then in this category. There is a standard story that goes along with these kind of deck-builders – you draw so many cards so often and shuffle your discards back into a new deck so regularly that it creates a genuine accessibility issue. The small number of cards you hold in your deck to begin with makes standard shuffling techniques awkward to do, but as more cards enter your deck the normal routines become feasible. The biggest problem here is that word-play is served well by being able to arrange letters into convenient groupings. You might want to keep the I along with the NG, for example, so as to discount them from the word you’re trying to make with your other cards. That tends to involve a lot of in-hand organisation, which won’t be easy if physical impairments must be navigated A card holder will be incredibly useful here. Hand sizes are variable, and draws of eight or more cards are not unusual. As such, you may want to consider making use of two card holders together. Luckily the cards are of a standard size, which makes handling them easier. It’s possible in some games to simply play your hands open. 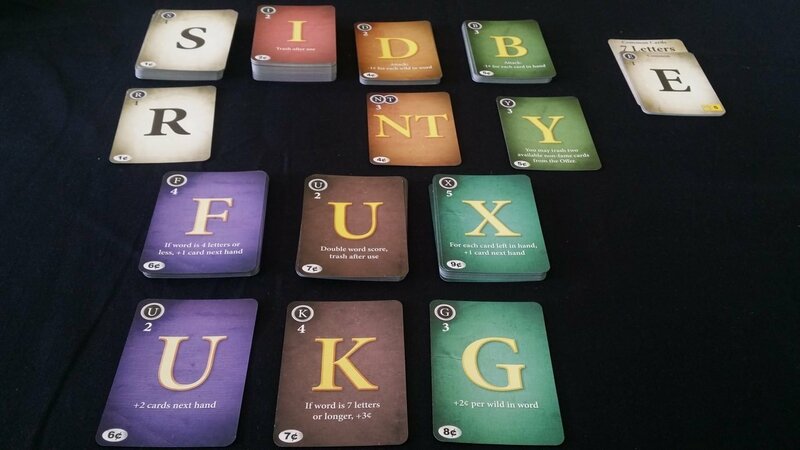 There is an incentive to keep the cards secret in Paperback though since the words you can form in a single turn will often omit particular letters, and some of those letters may have attacks on them. If they’re not part of the word, they’ll go unused. If you’ve got no particular reason to assume the attack is important, you might go for optimal scoring instead. If you know though your opponent could play a nine letter word making use of their wildcards, and thus claim a common card – well. You might want to consider playing a low scoring word just to make use of the attack that would stop that happening. The game does permit play through verbalisation, which is an important compensation for physical accessibility issues. You can simply state out loud which cards you’re playing in which order, and spell out the word as you do. There is nothing in the game that directly requires agency, although of course we prefer it when games make a special effort to allow those with impairments to play the game themselves. As such, we give it a recommendation – if you can manipulate a hand of cards, you can effectively play Paperback. For anything more serious, you can still issue your instructions meaningfully to other players without relying on their good-will to execute the instructions in your best interest. Communication is the most serious accessibility consideration in Paperback. It doesn’t just require a reading level, it requires verbal fluency and a considerable degree of ability to mentally navigate a linguistic possibility space. Larger words yield greater benefits than smaller words, which means that a restricted vocabulary will greatly limit effectiveness of play. It is unabashedly a word game, and if you don’t know the words you won’t have a lot of fun. Those with dyslexia or other linguistic complications would do well to avoid it. There is one more small expectation of communication – given the number of wild-cards it’s not feasible to always simply play out your word in silence. You’re going to need to indicate, through some means, what the wild-cards are supposed to represent in your word. This is only a minor issue though – we assume in general that communication between the groups of people that might play this game is substantively a solved problem. We can’t recommend the game to those for whom verbal fluency is an issue, but we can offer a strong recommendation otherwise. Let’s average it out to ‘we recommend this, with caveats’. The game is interesting in having only a woman on the box. One suspects it’s just because of the easy comic win of calling her ‘Paige Turner’ rather than out of any particular agenda of inclusion. 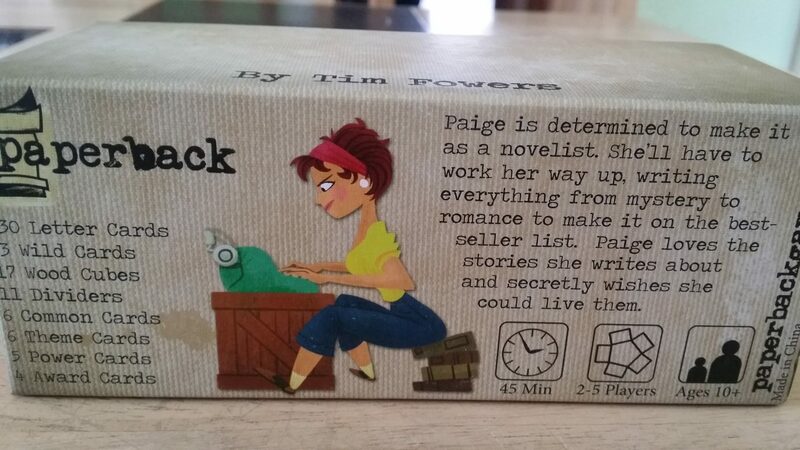 The artwork on the trashy novels that make up Paige Turner’s bibliography do lean somewhat heavily on the ‘buxom lass’ and ‘femme fatale’ tropes, but not exclusively. In one book, the cover art shows a skimpily clad alien woman, and on another an action pose of a wild-west outlaw. 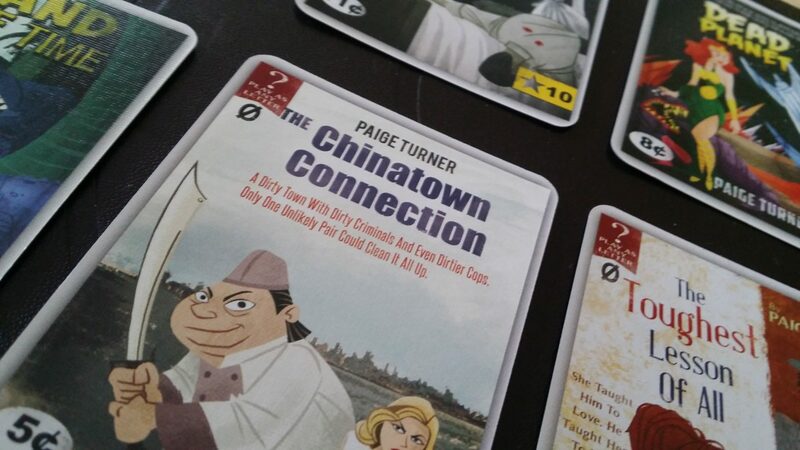 I have some minor concerns too about the artwork on the ‘Chinatown Connection’ which wobbles uncertainly on the line between parody and insensitivity. Which of these might you feel a little bit uncomfortable about reading on a bus? There are no troubling thematic elements – what could be more positive than encouraging writing and literacy? It supports flexible player counts, from two to five, and works well at all counts. There’s no overt sexism in the game, and no default assumption of masculinity in the manual. All good. I do have one complaint, which is in the presence of the dyslexia common card. I assume no bad faith here but it does play into the common inaccurate stereotypes of what dyslexia involves. Dyslexia isn’t just a flipping of letter positioning, but is instead a wide spectrum of symptoms that manifest themselves in complex ways. Its use in the common cards seems to be a throwaway joke, but it comes across as a discordant note in an otherwise considerate package. Considering the game is by its very nature likely inaccessible to those with dyslexia, it just seems cheap to have a laugh at their expense. The game itself has an RRP of around £20, but given its runaway success it can be quite hard to find for that price. The version on sale at Amazon is currently offered at not so much a price-point but a price-gouge. I got mine from Games Lore for a reasonable £17.50, but you might have to hunt around to find somewhere that has it in stock. If you can get it for something approach the RRP, it has an approximate ‘cost per player’ ratio of under four pounds. That’s pretty nice. I’m not sure how often you’ll find reason to get it to the table though – I have my doubts as to its replayability, given how samey games tend to feel after a while. Overall I give Paperback a strong recommendation in this category, with that single minor blemish of the dyslexia card being noted with a frown and a disappointed shake of the head. We have some of the usual suspects here. Hidden hands are sometimes a problem for those with visual and cognitive impairments, and it’s no different for Paperback. If you can’t make out the cards, can’t understand how the special conditions work, and can’t let someone else see your hand without game impact it’s going to create a problem unless you have someone there that’s not involved in the game to lend support. You rarely have so many cards in your hand that it’s difficult to manage, certainly not if you have access to a card holder or equivalent device. However, hands can be eight or more cards in length and this requires a degree of visual scanning along with mental assignment of letters to potential words and wild-cards. If you have difficulties in keeping a train of letter chains together in your mind, along with a difficulty in visually re-attaining state data, this intersection is likely to be an issue. In a competitive game, there is a limited ability to drop in and out. It’s not seamless, but as long as there are more than two players there’s no real game impact to removing your participation. The cards you have in your hand can be redistributed back to the offer, and the allocation of theme cards is at best a temporary situation anyway. If the player numbers drop below two though, the game has to end. Game sessions have an estimated length of 45 minutes, which rings about true. Game length though is highly configurable. You can easily vary the supply of fame cards, or common cards, to fine-tune duration. The length is not likely to be sufficiently rigid as to exacerbate physical, emotional or cognitive distress. Where there is a risk of that, the collaborative mode is more resilient to players dropping out without meaningfully diluting the satisfaction that wordplay offers. It would be worth considering this if you were at all concerned about the impact of players dropping out. It’s a broadly positive story, with thrills, spills, chills and… quills? Like one of the fine works of Paige Turner herself, you can come away from this feeling good about your chances of being able to experience meaningful and fulfilling engagement. The serious issues are inherent in the game design itself – the need for verbal fluency and mental exploration of a linguistic possibility space. You can’t design around that though if you’re aiming for a word game. In almost every area it could make concessions to accessibility, Paperback has a lot to recommend it.